Senator Songbird McCain is FOS (full o’ sh!t). 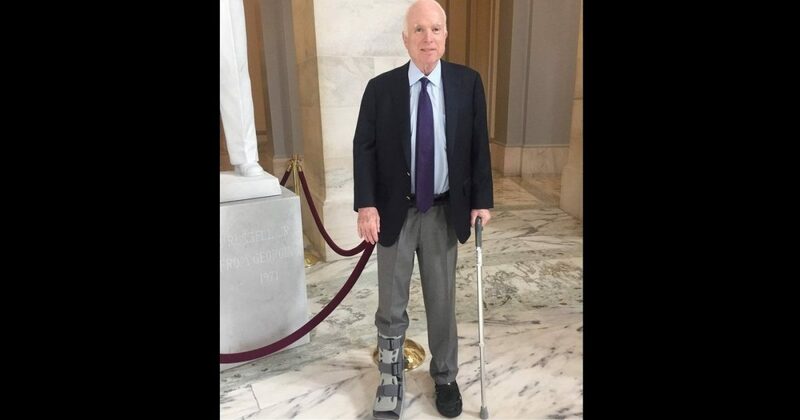 He claims he tore his right achilles tendon two weeks ago, and ordered immediate photo ops of him wearing a walking boot on his right foot (photo, above). Poor hero! Even in terrible pain, Songbird is fighting for We the People by not missing a day in Congress to trash and obstruct President Trump and the people’s agenda. The problem with being a completely FOS lying sack is you have to remember the lie, which at Songbird’s advancing age is not so easy. It seems that Songbird’s sympathy ploy horrible and painful injury is so bad he can’t remember which achilles is torn, as evidenced now by pics of him wearing the walking boot on his left foot (photo, below). Now how often do you put on a boot for a broken on the wrong one?